My son and I stumbled across this book in our local library this past summer. Since then, we check it out every visit it’s available. He is four and in love with trains, but there is more to the story, our story. For the fourteen months prior to finding this book, we were foster parents to a little two year old girl. We will call her Lola to protect her identity and privacy. Lola came to us neglected and to say that she was hard to handle is an understatement. But my son was so young when she came to our home, that he has no memory of her not being here. To him, Lola was his sister. She has always been here. Long story short, Lola was returned to her family after a very long placement in foster care. 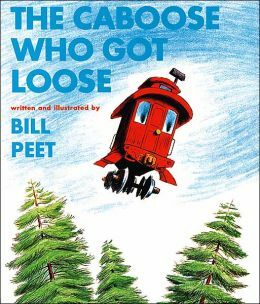 Bill Peet’s story, The Caboose Who Got Loose, touched a place in my son’s heart. The story is about a train Caboose named Katy who longs to leave her place in line. She wants to live on a hill or in the woods. Katy wants a different life. She resigns herself to be happy where she is and attempts to find a new perspective. Shortly after, Katy gets her wish and in a freak accident becomes lodged between two spruce trees!! Katy is thrilled…my son not so much. My four year old who begs for this book at the library cries at the end every time. You see, in his mind, Katy belongs with the train. Lola belongs with us. But the amazing thing is, The Caboose Who Got Loose has helped him find much needed closure! After reading it week after week, I almost have it memorized, he gets it!! Katy is where she needs to be. Lola has been home for awhile now, and we hope and pray that she is living the best life possible. I am sure Bill Peet never imagined his sweet story, with beautiful pictures would have such an impact on one child. I highly recommend this book to any family. It is a lovely story that will is full of humor, despite my son’s emotional response. Hug a foster parent if you know one, they probably need it!